How do you think about money? Do you manage it wisely? Savings? Investments? Are you Money$mart? Our Financial Scholars Program, Money$mart, is our commitment to our young people and to growing financial education in our community. By partnering with the award-winning EverFi Financial Literacy Program, we are providing ten area schools with online financial education courses to help students work towards financially responsible futures. There are a lot of valuable life skills that revolve around money and financial education. Paying rent, buying a car, learning about credit scores and the stock market, and planning for retirement are important things for young people to know. At Community Spirit Bank, we believe in giving back to the community and encouraging our youth. We’re here to help our young adults learn to be Money$mart! Community Spirit Bank sponsors the EverFi Financial Literacy program in ten area schools which include Red Bay, Russellville, Tharptown, Belgreen, Phil Campbell, Vina, East Franklin, Belmont, Tremont and Emmanuel Christian. Our Financial Literacy Mission is to encourage financial responsibility and help students settle into helpful money habits early. "EverFi opened the students minds to the financial responsibility that is required to be successful." 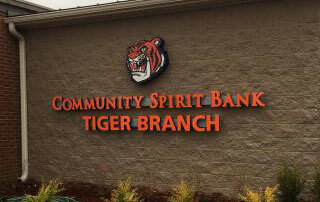 Our first student-led branch, the Tiger Branch, is open on the campus of Red Bay High School. It is student-led and staffed by enterprising young ‘Tiger Tellers’. Students and faculty can carry out banking transactions and learn more about banking in everyday life. By making this a part of student’s lives early, we hope to further financial education at all ages, from elementary through high school.